Lock in a great price for Suites Alba Resort & Spa – rated 9.1 by recent guests! The staff was accommodating and friendly, made excellent recommendations and offered all kinds of additional information. The beach accesss was private and gorgeous. I received the referral to stay here from an up and coming travel resource Ready & Roam and they really understand value for accommodations. I would return in a heartbeat. Room was amazing, clean and beautiful, garden was so amazing, staff was very friendly , breakfast is superb and the beach is awesome . The infinity pool and spa areas were fantastic! Location great if you have a car. Rooms were spacious! terrible service. it feels like youre bothering the staff. the room was disgusting and dirty. Villa is spacious, quiet and luxurious. Food in restaurant is exquisit, good wine list. Breathtaking views of the coast and cliffs. Nice walking trails to various beaches and view points. Staff at reception very helpfull. Surrounding gardens are beautiful and well maintained. Free access to good spa. These are basically little townhouses! I was a solo traveller and had a living room, dining room/kitchen/balcony, two bedrooms and nice big bathroom! The facility is steps away from the best views! The staff is very hospitality oriented and friendly. I had breakfast, lunch and dinner here and the food is excellent with many vegetarian options! What pure delight to be here! We were one going to stay one night and extended to 3. The view, accommodation, food and feeling is of the highest quality!!! Thank you Alba Suites! 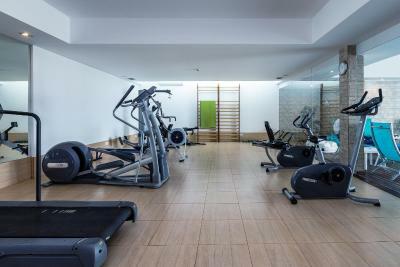 Suites Alba Resort & Spa This rating is a reflection of how the property compares to the industry standard when it comes to price, facilities and services available. It's based on a self-evaluation by the property. Use this rating to help choose your stay! 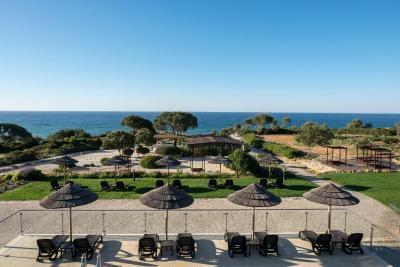 One of our top picks in Carvoeiro.Beautiful cliff-top, Suites Alba offers direct access to the remote Albandeira Beach. 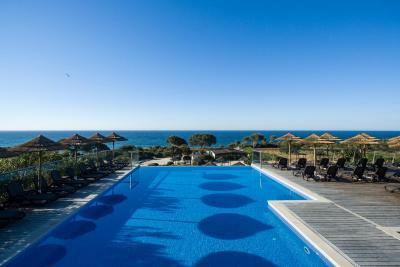 It has an infinity pool with Atlantic Ocean views, a peaceful garden and an elegant restaurant. 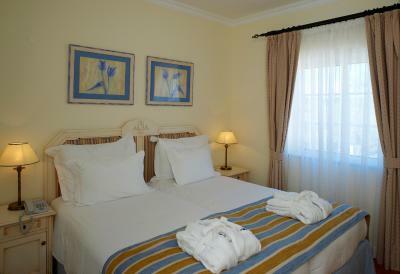 All rooms and suites at the Suites have polished wooden floors and garden or sea views. Rooms have LCD TVs with DVD players and spacious private bathrooms. The Morgadinho à la carte restaurant has panoramic ocean views, and Lounge Bar is a chill-out space serving drinks and snacks. Catedral de Vinhos serves candle-lit dinners and wine from the well-stocked cellar. Guests can enjoy golf or horse riding nearby. 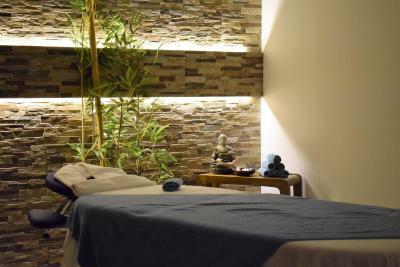 Alba also offers diverse treatments and therapies for those preferring to completely unwind on holiday. 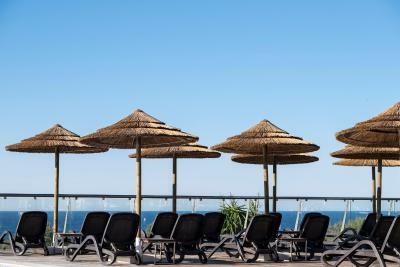 The Suites Alba is 45 minutes’ drive from Faro International Airport, and on-site car parking is free. When would you like to stay at Suites Alba Resort & Spa? 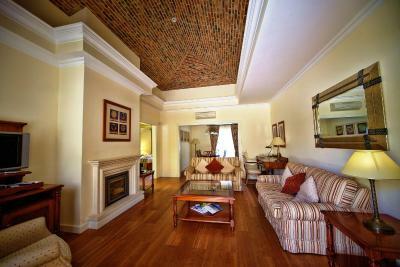 Classical in design, this Villa Suite is composed of 2 bedrooms, 1 bathroom, 1 living room and dining room. All Villa Suites contain a kitchenette, and all Villas have either terrace or balconies. Each suite features wireless Internet, air-conditioning system, fireplace, and LCD TV. Please note that the price is based on 2 guests. Maximum occupancy is 4 adults and 1 child (see Hotel Policies). This very spacious accommodations has wooden floors and furniture. It features a private balcony or terrace with views of the Atlantic Ocean. Each has 2 bedrooms, a lounge room with a fireplace, and a kitchenette. - Complimentary access to the Spa. On 1st floor this suite is closer to the restaurant, pool and spa. Features elegant decoration and has one bedroom and a spacious living room, a kitchenette, a bathroom with hot tub for 2 people and a separate shower. This room features air conditioning and a balcony. It has a fireplace and TV including a DVD player. It offers a kitchenette and mini-bar. 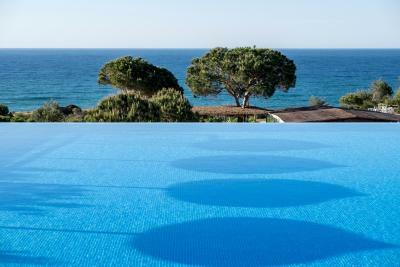 House Rules Suites Alba Resort & Spa takes special requests – add in the next step! Suites Alba Resort &amp; Spa accepts these cards and reserves the right to temporarily hold an amount prior to arrival. Suites Alba Resort & Spa accepts these cards and reserves the right to temporarily hold an amount prior to arrival. Please note that each child is charged 50% of the adults' fee. Guests should include their invoicing details (name, address and VAT number) in the Special Requests box when booking. Please note that the use of swimming cap is compulsory for the indoor swimming pool and hot tub. Please note that pre-payment is charged at the time of the reservation. Please inform Suites Alba Resort & Spa of your expected arrival time in advance. You can use the Special Requests box when booking, or contact the property directly using the contact details in your confirmation. Amazing place!!! The staff is very nice and helpful. They really took good care of us and made our days there unforgettable. We couldn’t ask for more. This hotel is just not a five star hotel, by any standard. The rooms are just average in terms of decor and comfort, the bar and restaurant area is very average - in fact we had a drink in the bar one evening and found it thoroughly depressing! The spa seemed nice but the enforcement of wearing a swimming hat put us off even using it. All round the standard of the hotel was just a big disappointment. The staff here were lovely and the views are stunning. I've been to Suites Alba before with my mum and wanted to take my boys. It certainly didn't disappoint. The location is marvellous if you like (comparatively) unspoiled beauty, the resort is just lovely with plenty of room in our suite to spread out. The breakfasts are fabulous, with something for every taste and plenty of it. And the staff are just so friendly and welcoming. As for dining in the restaurant at night, it's pricey but that's only right since it's top-class food (my husband was in ecstasy). Very nice location away on a cliff. Spacious and clean rooms. Very well maintained garden with nice swimming pools. Beautiful place, friendly staff, great breakfast, beautiful location and convenient to get to from the airport. It was also an incredible deal in February. Not being able to use the indoor pool without a bathing cap so didn't use it at all. The location was very peaceful, excellent views, suites were exceptionally clean with everything you needed. Will certainly go back. The bar is very small and the area around the resort after dark hours is a bit remote. But if you're driving that shouldn't be a problem. The roads close to the resort are very narrow, so hiring a very big vehicle could be troublesome. Amazing breakfast, the egg tarts were especially delicious. Great staff. They helped us with hiring scooters and gave us information about the areas. They were always very helpful. The best part is the location. The beach just next to the hotel is so gorgeous! Waking up to see the sunrise and sunsets in the evenings were major highlights of our trip. The rooms are so spacious. It's like having your own house. We were two friends and had loads of fun. There is a functional kitchen as well, in case you wish to cook something light. The spa was amazing as well. We enjoyed the free spa services as well as the spa package. Highly recommended. Would definitely go back to this beautiful resort. Please don't miss out on the beach next to the resort. It looks small from the top but is really a hidden gem. overall ambience and the exceptional location. I really loved this wonderful, beautiful place. The staff is so caring and friendly. My stay at the resort was a relaxing mixture of great food, the lovely coastline, horse back riding and spa. Really wonderful. We had paid extra for ‘seaview’ but ‘seaview’ appeared a bit of sea in the far distance. Towels were removed, although we had not put tem on the floor. Would have been better for the environment if we could have used them again. Some noise from the neighbours. The swimmingpool, hot tub and sauna were very good when we were with only two people. But they are rather small and at the rush hour it was far too crowded. Wifi not very strong. Quiet resort. Nice beaches, beautiful garden. Appartment very spacious, comfy and very clean. Breakfast with lots of fresh fruit. Nice but prententious and rather pricey restaurant, with only very few guests.